Thus far, the S&P 500 has remained above all four 2018 lows shown below. 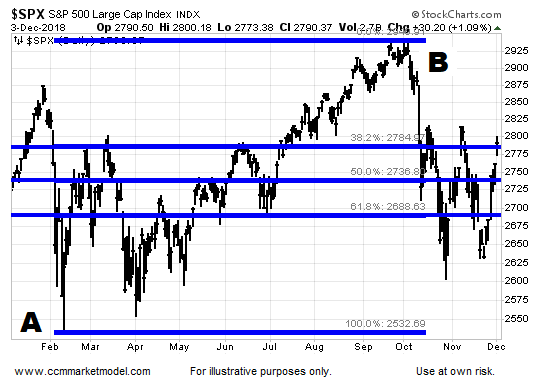 Price action near the February low/September high (A to B) retracement levels tells us to keep an open mind about all outcomes. A prolonged stay above all three retracement levels would be a welcome sign, but falls into the TBD category. Monday’s open created a gap. The market may choose to backtrack and fill that gap; something that is not all that relevant to our longer-term investment horizon. As shown via the 2011 case below, even if the recent lows in the S&P 500 hold, volatility will most likely be part of the day-to-day equation. There were no shortage of red sessions after the October 2011 low. After periods of volatility and stress, we want the market to calm down and give us some type of definitive “all clear” signal. 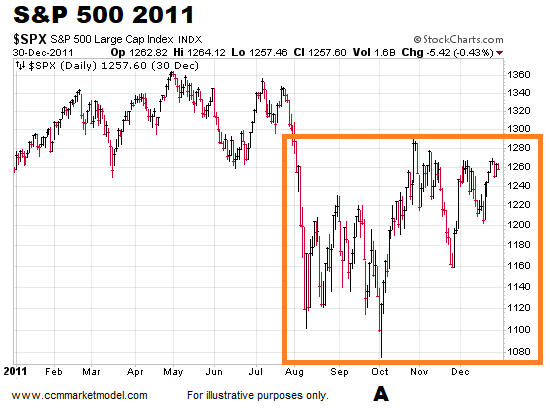 After the low in 2011, the market did get “easier” given the S&P 500 rallied 72% between point A and point B. 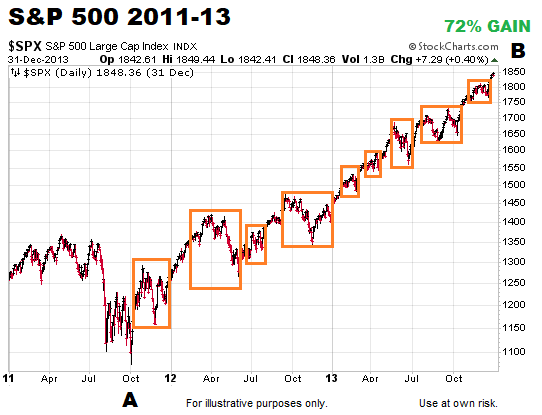 However, the orange boxes below highlight the number of pullbacks and red days that occurred in the “easier” market. If we were watching the market too closely after the 2011 low, it would have been easy to get baited into overtrading, which can lead to frustrating whipsaw after whipsaw. The S&P 500 closed Monday 187 points above the October low and 258 points above the February low, providing some short-term breathing room. The bulls have made some progress over the past six trading sessions, but have yet to push the market above the previous rally attempt highs. We will continue to take it day by day. This week’s stock market video reviews present-day levels of concern relative to the periods following the 2000 and 2007 major tops. Older PostWill The Trade War Lead To A Recession And Bear Market?